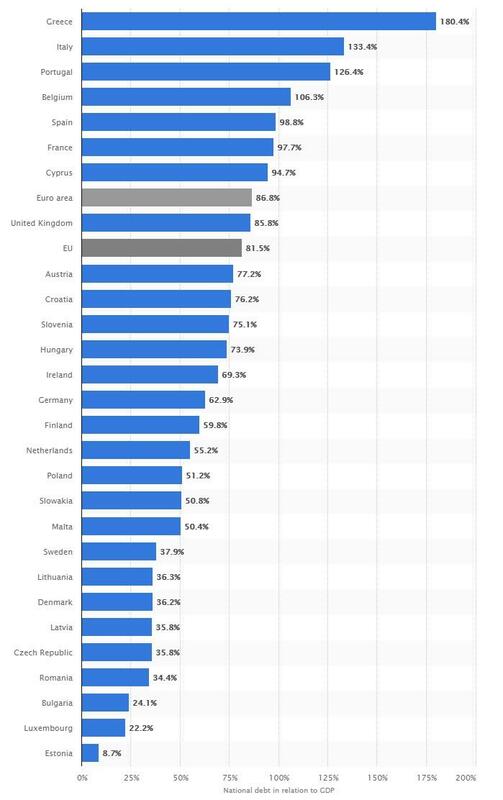 In the aftermath of Italy's defiant announcement that it would expand its 2019 budget deficit to 2.4% of GDP, above both the initial proposal from finmin Tria which was 1.6%, and also higher than the European "redline" of 2.0%, the question was how would Europe respond to this open mutiny by Italy. The answers started to emerge on Friday, when European Parliament head Antonio Tajani said that fiscal targets set by Italy's eurosceptic government were "against the people" and could hit savers without creating jobs. "I am very concerned for what is happening in Italy," said Tajani, who is a center-right opposition politician in Italy and close ally to former Prime Minister Silvio Berlusconi. The budgetary plans "will not raise employment but will cause trouble to the savings of the Italians," Tajani said. "This budget is not for the people, it is against the people," Tajani said, adding that the planned measures "will create many problems in the north (of Italy) without solving problems in the south," which is the least developed part of the country. Separately, Pierre Moscovici, EU Economic Affairs Commissioner, said in an interview with BFM television that “Italy, which has debt at 132 percent, chooses expansion and stimulus. It’s “a budget that looks like jaywalking, and out of line with our rules." The verbal fireworks continued, with Moscovici reminding Italy that the only reason its "explosive" debt hasn't collapsed is due to the ECB's purchases, which has been actively monetizing it for the past few years. In turn, Italy's Di Maio swiftly brushed away Moscovici, with Bloomberg quoting him as telling reporters at a Rome event that "the concerns are legitimate but the government has committed itself to maintaining the deficit-GDP at 2.4 percent and we want to repay the debt." Salvini was similarly confident. "Markets will come to terms with the budget," he said in a Facebook video. The verbal spat took place amid a broad-based liquidation of Italian assets which saw 10Y Italian yields rise as much as 35 basis points to 3.24%, the biggest increase since a rout in May during the government’s formation. The yield spread over Germany reached a three-week high. Christoph Rieger, Commerzbank’s head of fixed-rate strategy chimed in, saying that investors are right to be nervous with the budget compromise at the high end of the range that had been talked about before. For now, the European response to Italy's defiance has been confined to verbal escalation. 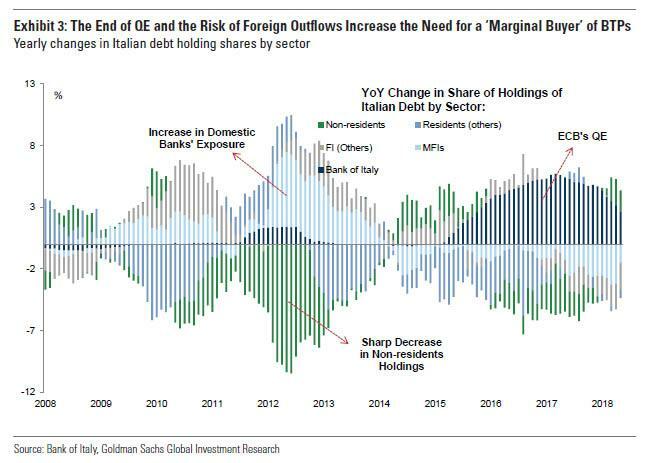 As Bloomberg notes, Italy has to submit its 2019 budget for approval to the Commission by Oct. 15, at which point Brussels has the power to impose fines of up to 0.2% of GDP on countries that persistently break the bloc’s fiscal rules. What would complicate a crackdown on Italy is that when "push came to shove" in 2016, the Commission opted to not penalize Spain and Portugal - the culprits at the time - and instead imposed symbolic zero sanctions. Additionally, the loosened budget target is seen as a setback for finance minister Tria and President Mattarella, who had "sought to moderate the more extreme instincts of the government" formed in June by Di Maio’s anti-establishment Five Star Movement and Salvini’s anti-migrant League according to Bloomberg. On the other hand, it shouldn't be surprising that a country which has demanded populist policies ends up with just that.